What’s the special “Mom’s flavor” in your heart? My mom likes simple ancient Chinese recipes, such as Mapo Tofu or Moo Goo Gai Pan (even though this is not what we call it back home). But my favorite one is always Egg Fried Rice. For you, the answer may be different. Is it apple pie? Rich and meaty lasagna? Or mac & cheese? Most of us grew up in Mom’s kitchen and wait to be served the delicious homemade food. We take it for granted until one day we move out, or start our own family and have our own kids to feed; we suddenly realize that “Mom’s flavor” is such a special and essential element in food. We want to go to the grocery store around the corner, or travel twenty miles to our favorite pizzeria to find it, but it’s not there. At least it happened to me countless times. I thought I could make the food taste exactly the same as how my Mom made it. But I never succeed. Just a few days ago, I was so thrilled to get a cookbook with an eye-opening fried rice recipe, called pineapple fried rice. It has a beautiful picture with the fried rice sitting inside a half pineapple! How cute is that! I fell in love with this recipe immediately! I could imagine how entertaining this cooking process would be. So I did a little research and applied some simple twist to this recipe, which I am going to show you later in this post, along with four other amazing fried rice recipes I learned from my Mom. After I made the Pineapple Fried Rice, I was so happy with the result and quickly leafed through the entire book (check it out). As I was reading the title and preface, I could feel my eyes becoming damp. In memory of the author’s Mom, she delicately named the book <<Everyday Chinese Cookbook 101 Delicious Recipes From My Mother’s Kitchen>>. In the preface, she also told the story about her Mom’s life and food adventure, and the time they spent together in the kitchen. She said about her Mom, “I realized she used cooking as an escape from her many struggles, and that’s where she found joy.” Every Mom doesn’t want to burden their children with their own problems or struggles. When we were small, have any of us truly understood and appreciated the affection and love they devote to the dinner table, despite their own difficulties? 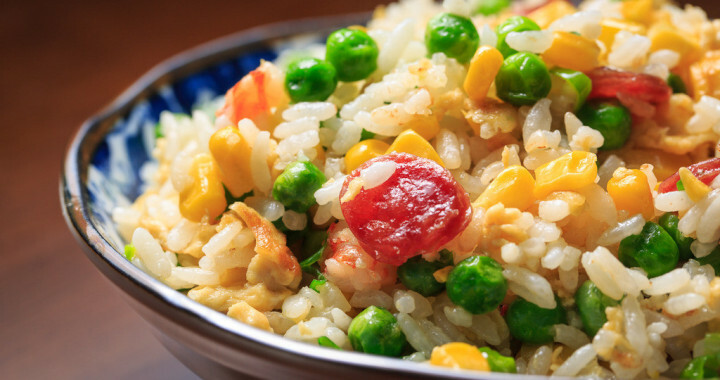 Fried rice is a common staple in Chinese cuisine, but can be found in many other countries as well, such as Korea, Nepal, Philippines, Singapore, Thailand, Cuba and more. Canton Fried Rice – the main ingredients are rice, ham, egg, onion, frozen peas and chicken soup stick. Fujian Fried Rice – it’s served with a delicious and rich sauce made shrimp, scallop and mushroom. Yuan Yang Fried Rice – an interesting application of the Chinese “Yin Yang” philosophy. Basically, you will have two tastes on the same plate. Half of the plate is topped with a savory white sauce, and the other half is topped with a red tomato-based sauce. Yangzhou Fried Rice – it’s the most commonly found type of Fried Rice in Chinese restaurants, also known as “Special Fried Rice”. The main ingredients are scrambled egg, barbecued pork and shrimp. In Korea, the most popular fried rice is called Kimchi Fried Rice, apparently made with Korean pickled cabbage and other handy ingredients. In Nepal, people usually eat the Fried Rice with Achar, South Asian style pickles, made from a variety of fruit and vegetables, such as mango, lime, tomato, carrot or mushroom, whatever you like. In Philippines, Fried Rice is served as part of the breakfast. It has a relatively light flavor because of the cooking method and ingredients. Stir-fry garlic first, add rice and then season the rice with salt and pepper. In Singapore, they call it Sambal Fried Rice. Sambal is a hot sauce made from a variety of ingredients, including chili peppers, shrimp paste, fish sauce, garlic, ginger and etc. In Thailand, Fried Rice is a widespread dish, but has its unique flavor due to the use of jasmine rice. The recipe varies from region to region. Pineapple Fried Rice, Basil Fried Rice and Coconut Fried Rice are just a few examples. In Cuba, as many Chinese Cuban live there, their Fried Rice is similar to Chinese Fried Rice. At this point, maybe you are just as confused as I am. There are so many variations on Fried Rice. You can pretty much make your own Fried Rice without any recipes, as long as you know a few key points on how to prepare and make Fried Rice. We will start from the basic, yet my favorite recipe – Chinese Egg Fried Rice. If you understand how to prepare and make this dish, you are open to countless options. Use day-old rice. Cook the rice ahead of time and chill it in the refrigerator. This can ensure the best texture needed for the rice. Being too dry or too moist, the rice can affect the result tremendously. When using the rice, try to break up the clumps as best as possible. Beat the eggs and whisk to blend. Add salt and pepper required for the entire dish to the eggs. It can help distribute the flavor evenly. After heating up the oil and add eggs, stir the eggs clockwise using a spoon or chopstick. Use good judgment to determine when the egg is ready. It can’t be too moist or too dry. The color is the key: if the egg is still in light yellow, it means it’s not ready yet. Once it gets orange, it means it’s overly cooked. The right color should be yellowish brown or dark yellow. After you add rice to the eggs, stir-fry until you see some white mist hanging above the rice. Cut the pineapple in half lengthwise. Use a knife to carefully cut deeply around the inside of the pineapple. Follow the rim. Please don’t pierce through the skin. Remove the flesh. Use a spoon if necessary to remove the remaining. Cut the flesh into 1-inch-wide cubes for reserve. Cut the carrot and sausage to 1-inch-wide cubes also. In a medium bowl, combine the eggs with 1-teaspoon salt and dash of pepper. Whisk to blend. Heat a pan over medium heat and stir fry Chinese style sausage. As Chinese style sausage contains some fat, you don’t have to add any oil in this step. Add carrot and stir-fry for 1 minute. Add peas and continue to stir-fry. Heat a tablespoon of oil over medium heat. Add the cooked rice and stir-fry for 2 minutes. Add eggs and continue to stir-fry until eggs have set. Add carrot, peas, sausage, pineapple, and scallions. Stir-fry for 2 minutes. Season to taste with the salt and pepper. If you want, you can transfer the pineapple fried rice to the half pineapple shell and serve. In a large bowl, mix the rice with a few drops of sesame oil. Bring a pot of water to a boil. Boil the carrot, green peas and corn for 2 minutes. Remove and set aside. Heat up 1 tablespoon of oil in a pan. Stir-fry the ham for 3 minutes. Remove and set aside. In a medium bowl, whisk the eggs to blend. Heat up 1 tablespoon of oil in a pan. Fry the eggs for 10 seconds. Add ham, corn, green peas and carrots and continue to fry. Add 1 teaspoon salt and ½ tablespoon oyster sauce. Mix well. Separate egg white from egg yolk and transfer egg white to a small bowl. Set aside. Add egg white to the rice. Mix well. Marinate the shrimps in soy sauce for 15 minutes. Heat up 1 tablespoon of vegetable oil and a few drops of sesame oil in a pan. Add a cup of onion and half of the chopped scallions. Add corn, carrot and green pepper. Stir-fry for 2 minutes and group all ingredients to the side of the pan. Add egg white on the other side of the pan. Add shrimps and continue to stir-fry. Add rice and Laoganma. Stir-fry for another 5 minutes. Season to taste with the salt. Bring a pot of water to boil. Boil the spinach for 10 seconds. Remove and drain. Cut the spinach to dices. In a medium bowl, whisk eggs to blend. Reserve half of the eggs in the bowl. Use the other half to mix with rice. Heat up a tablespoon of oil in a pan. Add half of the chopped scallions and stir-fry for 15 seconds. Add diced bacon. Add peppers and continue to stir-fry. Add the mixture of rice and egg. Patiently stir-fry. Make sure no big clumps. Add the other half of the egg and scallion. Continue to stir-fry. Add spinach and a teaspoon salt. Season to taste. Ready! Soak dried mushroom in warm water. Reserve the water for later use. Prepare the sauce: in a small bowl, combine 1 tablespoon cooking wine, 2 teaspoon light soy sauce, 1 teaspoon dark soy sauce and ½ teaspoon sugar. Add 3 tablespoon mushroom water. Heat up a tablespoon of oil in a pan. Stir-fry scallion and ginger for 20 seconds then remove. Add chicken dice and stir-fry for 2 minute. Add diced mushroom and dried shrimp. Stir-fry for 1 minute. Add the sauce prepared in step 2. Boil over medium heat until the sauce thickens. Add rice and stir-fry until all ingredients are evenly distributed. Add scallions and ready to serve!